It’s hard being the most famous commercial star in Japan since every project starring Kimura Takuya is scrutinized for whether it conforms with his past string of successes or a sign that his star is waning with a less than stellar reception. 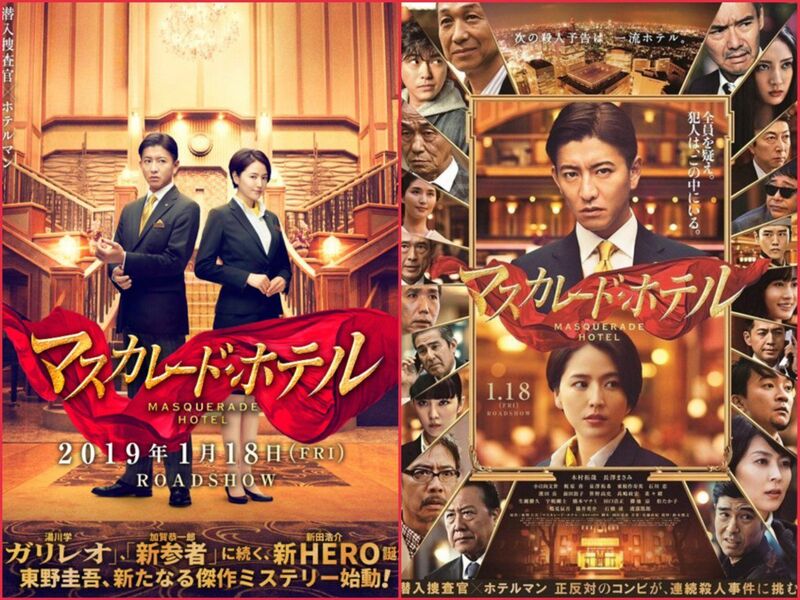 KimuTaku’s dramas nearly double his movie projects his his most recently released detective movie Masquerade Hotel has turned out to be a box office champ to start off the new year 2019. The movie costarring Nagasawa Masami has been number 1 in the box office for two straight weeks and looks hella entertaining from the trailer chock-a-block with so many cameos to keep up. It’s based on the same title mystery novel by writer Higashino Keigo about a grizzled detective going undercover as a hotelier in order to catch a serial killer at the location he/she is projected to strike next. There’s an added bonus of the director for Masquerade Hotel having worked with KimuTaku multiple times before with Long Vacation, Hero, and Priceless.